In recent clinical trials, doctors in several countries have tested the ability of a patient’s bone marrow cells to repair damage, such as heart attacks and peripheral artery disease, created by problems of blood flow. Yoon’s team focused on the molecule CD31, also known as platelet endothelial cell adhesion molecule-1 or PECAM-1, because of its presence on endothelial cells—the cells that form the inner lining of blood vessels. In experiments with donated blood from human volunteers or mouse bone marrow cells, the researchers showed that cells with CD31 on their surfaces secrete hormones that support the growth of blood vessels. “We can show that after transplantation, some CD31 positive cells do become endothelial cells, but their main effect is more to support other cells than to become the building blocks,” Yoon says. The researchers used antibodies against CD31 to sort human blood or mouse bone marrow cells into two groups: cells with CD31 and those without. They then tested these cells’ ability to spur blood vessel regrowth in mice whose hind legs had a blocked blood supply. 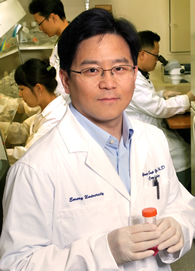 “Based on the insights gained from preclinical and clinical studies from several investigators, we view the use of CD31 positive cells as a second-generation cardiovascular cell therapy that could be a novel option for the treatment of peripheral artery disease,” Yoon says. S.W. Kim, H. Kim, H.J. Cho, J.U. Lee, R. Levit, and Y. Yoon. Human Peripheral Blood-Derived CD31+ Cells Have Robust Angiogenic and Vasculogenic Properties and Are Effective for Treating Ischemic Vascular Disease. J. Am. Coll. Cardiol, 56: 593 – 607 (2010).